Analysis In the blue corner: Candy Lab, a maker of augmented reality games, which doesn't want people banned from playing its distractions in public places. In the red corner: attorneys representing Milwaukee county, which wants to protect its parks from being trashed by boozy, stampeding gamers. Candy Lab thinks free speech protections should prevent bylaws from being put in place to block augmented reality games from being used in certain spaces outdoors, such as parks. The Milwaukee lawyers disagree. It's a battle over reality: it's not so much game visuals invading the real world, it's the real world and its rules and laws invading games. Last year, a different game company, Niantic, released Pokémon Go, an augmented reality game that encourages players to hunt for animated creatures that have been placed at real-world locations. Over the summer, the game proved popular enough that at least one military installation, Joint Base Lewis-McChord, warned troops to be careful hunting for Pokémon. In August, Milwaukee's Lake Park saw swarms of Pokémon Go players, some of whom trampled and trashed the area, making a general nuisance of themselves. Not everyone behaved badly, as John Dargle, Jr, director of the Milwaukee County Department of Parks, Recreation & Culture, acknowledged in a letter [PDF] at the time. But a subset of thoughtless gamers created enough of a burden that Milwaukee County Supervisor Sheldon Wasserman proposed an ordinance [PDF] to require augmented reality game makers to obtain a permit to use county parks in their apps. The ordinance was approved and took effect in January. It has become a solution waiting for a problem – according to a spokesperson for Milwaukee County, no game maker has bothered to apply for a permit since then. 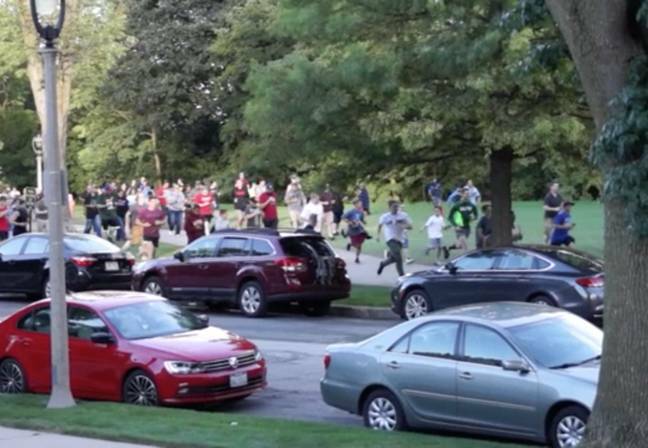 The flash mobs arising from Pokémon Go have turned out to be a singular phenomenon. According to a ComScore report, the number of daily average users of Pokémon Go in the US went from 28.5 million in mid-July, 2016 to about 5 million by the end of the year. Nonetheless, in April, Candy Lab, a maker of augmented reality games based in Nevada, filed a lawsuit "out of genuine fear and apprehension that this ordinance, conceptually and as written, poses a mortal threat not only to Candy Lab AR's new location-based augmented reality game, but also to its entire business model, and, indeed, to the emerging medium of augmented reality as a whole." Assuming liability for the behavior of players. Providing $1m in general liability coverage. Sending a company representative to areas where the game is being played. Providing portable restrooms for every 100 players in an area. Pre-approval of content and content revisions. Taxes on revenue from in-app purchases made in permitted areas. Forced display of the Milwaukee County insignia. Candy Lab's concern is that rules of this sort, if adopted elsewhere in the US, would bankrupt companies involved in augmented reality games. And legislators have begun paying attention on a national level.